In the Adaniya district of Kitanakagusuku Village there are two large hills on the grounds of what is now called Wakamatsu Park. 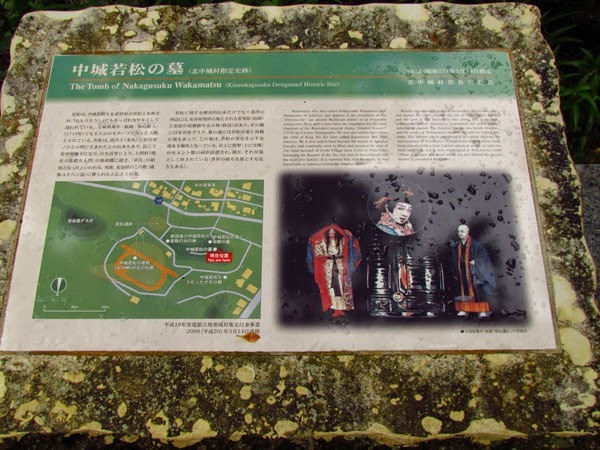 (i) The smaller of the two is called Yunahan Hill and is the final resting place of Lord Nakagusuku Wakamatsu l.(1)(ii) To the east, on a much larger landmass, are ruins of the Adaniya Gusuku. (2) At one time, Lord Wakamatsu was the leader of this domain and by all accounts was as a very good leader. (1) His fame became the subject of royal Okinawan poems called Omoroshoshi, and his persona was the driving force behind the main character in a famous play titled, Shushin Kane Iri, authored by the great Chokun Tamagusuku in 1719. (1)(iii) After his tenure in Adaniya, he was assigned as Land Stewart (Jito) for Uema Village, now the Uema district of Naha City. (1) To honor his legacy and contributions, the park was named in his honor and is known as Wakamatsu Koen (Wakamatsu Park, 若松公園). Kanamaru eventually moved from Izena. 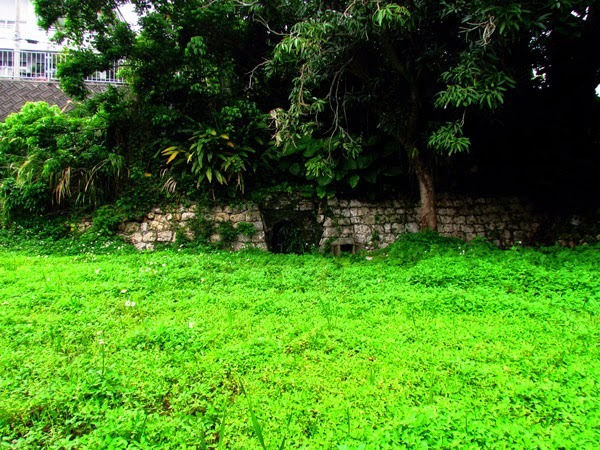 He temporarily settled in a village called Ginama, located on the northwestern side of the Okinawa main island. Later, he set forth to Shuri where his talents were quickly recognized by the royal government. Once established, he rose high in the ranks before he seized the throne in 1469 and assumed the title of King Shō En in 1470. (6)(8) Years before he became king however, he had married another woman by the name of Yosoidon. Together they had a son (Shō Shin) who would become the third king of the Second Shō Dynasty. (viii) There is no account in George Kerr's book that a Lord Wakamatsu was an off-spring of Shō En. How this legend came about is uncertain by the author. Further research is pending. Perhaps the answer lies with the woman, the Noro Adaniya. Her role may shed light to this myth, as it doesn't seem to be documented anywhere else. 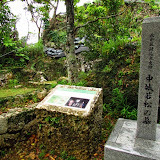 Wakamatsu's Tomb. 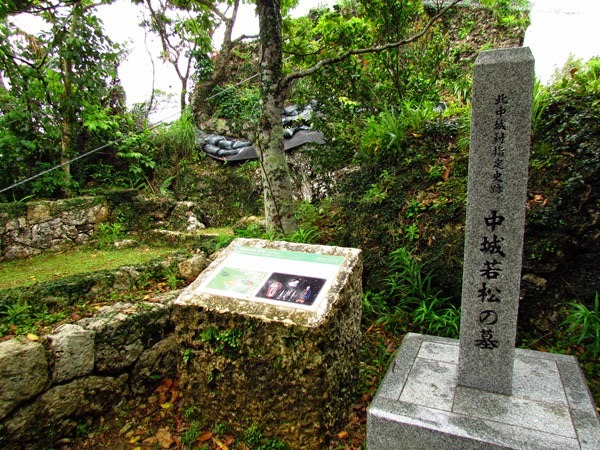 Wakamatsu's grave sits on top of Yunahan Hill. 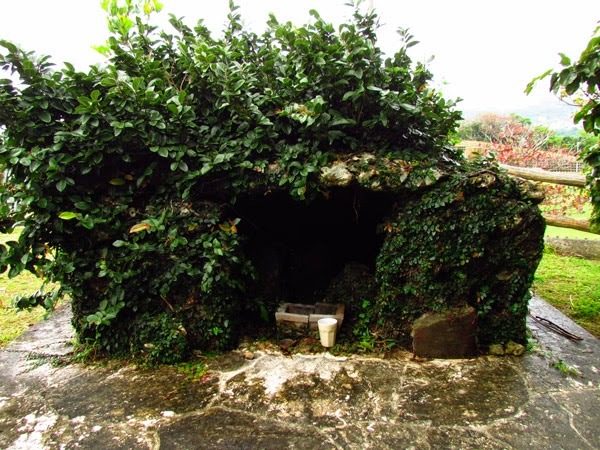 As of March 2014, renovation was in progress to stop the erosion near his tomb. 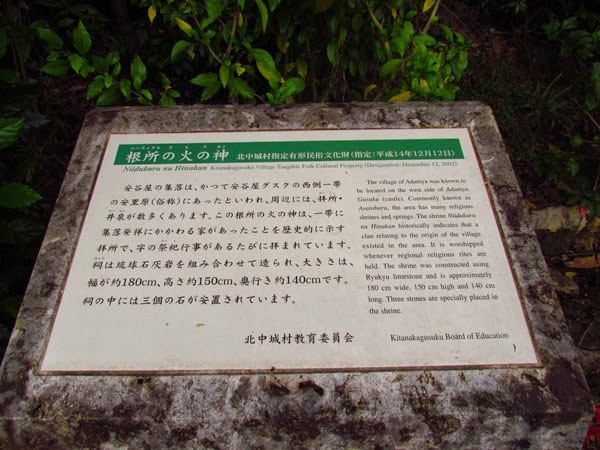 According to the historical sign there was spherical rock (hoju) that once laid on top of his tomb. 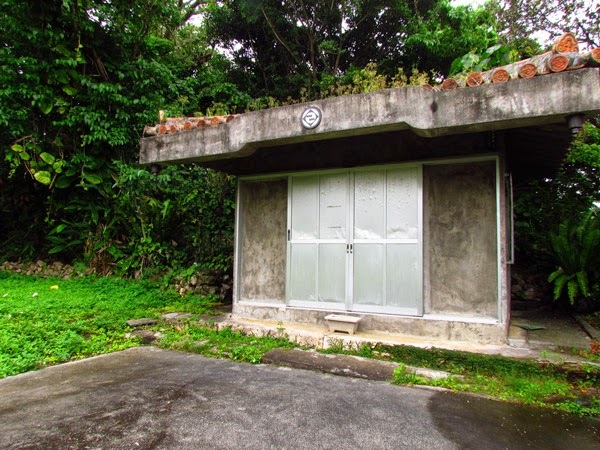 (1) The Kitanakagusuku Historical Office said it was removed during the renovation process. 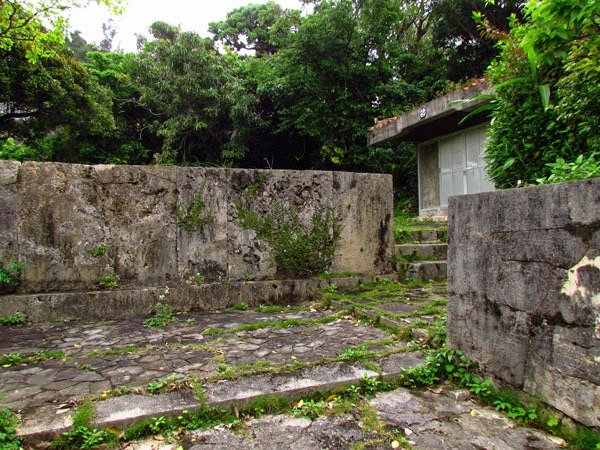 The remains of Wakamatsu's wife and children (located near Lord Wakamatsu's tomb) was also said to been removed. It is not certain if both the stone or the remains will return to their original location. The Adaniya Gusuku. The term gusuku can have different meanings. It could mean castle, domain, or a sacred grove. Typically they are found on a large landmass. No dates were given about the origins of the Adaniya Gusuku. Considering Wakamatsu's time of existence, possibly during the 15th century (author's speculation(v)), the Adaniya Gusuku would then seem to predate this time period. 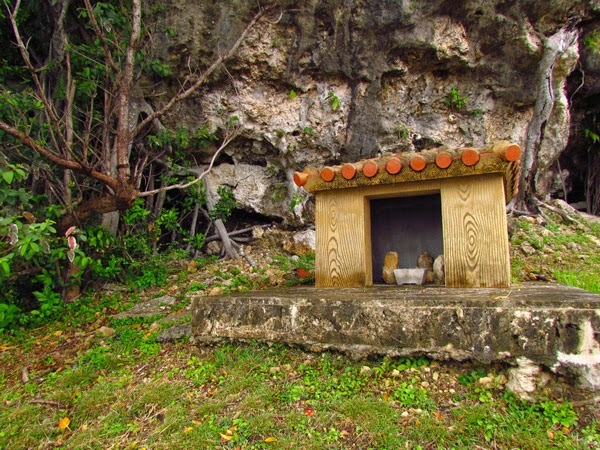 Currently, there is a network of trails throughout the gusuku location with areas deemed sacred by local villagers. Please see photo album for additional pictures. The Cave. Near the Niidukuru Hinukan is a path that skirts the treeline and takes you to a small cave. Local villagers call this the Kuganijiga. 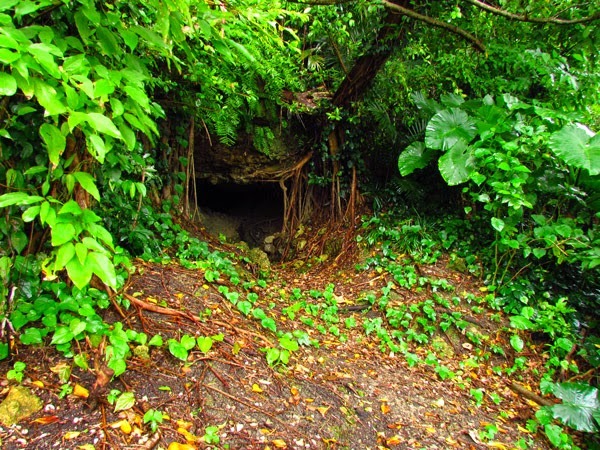 Typically, the term gama, an Okinawan word for cave, is affixed to the name of a cave. However, this cave is not revered for its cavity. The suffix -ga refers to a spring and at one time a spring existed at this location. Residents offer prayers near the entrance of this cave. (4) Advisory. 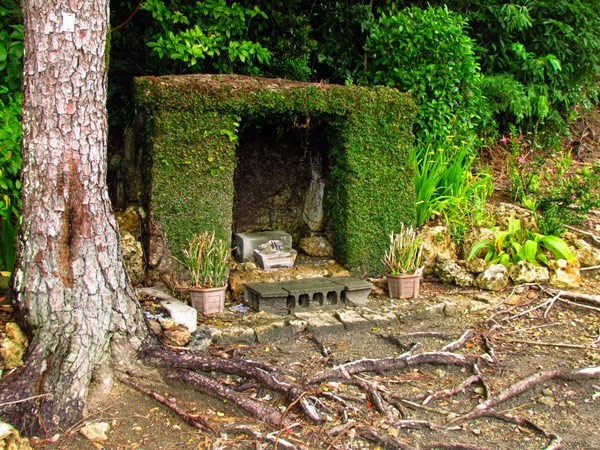 Please show religious sensitives as local villagers often pray at this location. iv. No date was obtain on when Wakamatsu's family hinukan was relocated. v. A timeline of Wakamatsu life was not provided by the Kitanakagusuku Village Office. If the legend of Wakamatsu being the son of King Shō En (1469) were true then that would put Wakamatsu 's existence some time during the 15th through the early 16th century. vi. The Noro Adaniya(1), believed by the author to mean the noro of Adaniya, meaning the priestess of Adaniya. Directions. Wakamatsu Park is in Kitanakagusuku Village near the intersection of Highway 81 and Highway 146. The entrances to the parking lot however, lie along Highway 81. You can only access the parking lots on the westbound lane. 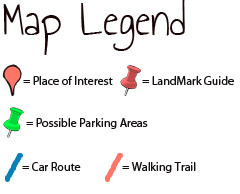 See Map above for LandMark icon to the main parking lot.